Marijuana is a mixture obtained of the dried flowers of a plant called Cannabis sativa. It is often smoked in rolled cigarettes – generally called joints – but can also be used to brew tea or can be mixed with other ingredients and incorporated into foods and drinks. Marijuana is largely used for recreational purposes, but studies have found that it has significant benefits for the human body and has the ability to relieve pain and stress. For this reason, it is also used for medical purposes. The debate regarding the use of medical marijuana is a key topic of discussion in many countries, and divides masses and politicians. 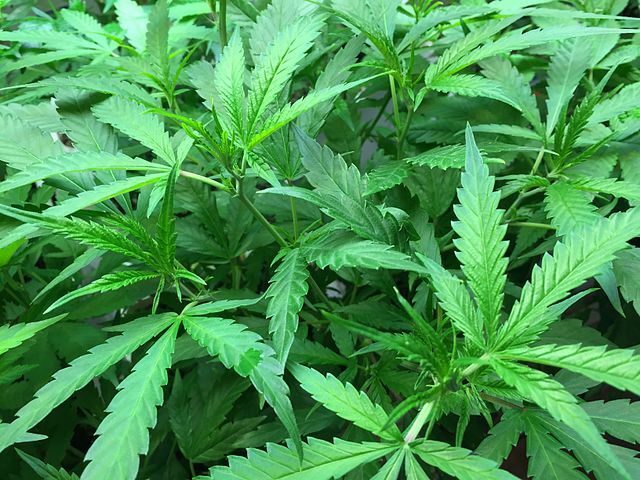 Medical marijuana uses the chemicals contained in the plant of marijuana to treat a number of diseases and conditions, including Alzheimer, appetite loss, muscle spasms, migraine, nausea, effects of chemotherapy, pain, including chronic pain, multiple sclerosis and a number of other conditions. The product used for medical purposes is the same used for recreational ends, and contains over one hundred different chemicals that have different effects on the body, helping to ease pain and relax. Medical marijuana has the power to reduce inflammation, reduce anxiety, control nausea and other symptoms caused by chemotherapy, relax tight muscles in the case of multiple sclerosis, stimulate appetite, improve weight gain in people with eating disorders, AIDS and cancer, and even kill tumor cells and slow cancer’s growth. For all these reasons, marijuana is often employed for medical purposes, and its use has been legalized in a number of states and countries. Yet, not all administrations agree to the medical use of marijuana, and there are a number of key differences between regulations concerning marijuana in Canada and the United States. Canada is close to complete liberalization, while the US government has a more conservative approach, although individual states have different laws and regulations on the matter. What are Marijuana Laws in Canada? The use of medical marijuana is legal in Canada and as of June 2018, bill C-45 was given royal assent and the complete legalization of recreational cannabis, in addition to the already legal medical use, will come into effect on 17 October 2018. The use of marijuana was prohibited in 1923, but the use of medical marijuana was legalized in early 2000s. Since then, there has been significant progress on the matter and Canada has today become one of the most liberal countries in the world for the use of medical and recreational marijuana. In Canada, a number of researchers are focusing on the properties and benefits of medical marijuana, and have supported the complete legalization, which should come into effect in late 2018. Make cannabis products at home, such as drinks and food, without adding additives that might increase the concentration of marijuana. In addition, the act includes strict regulations regarding the sale of marijuana to youth, and criminalizes possession over the limit, illegal distribution or sale, production beyond personal cultivation, giving or selling marijuana to persons under 18 years of age and moving cannabis across the Canadian border. What are Marijuana Laws in the US? In the United States, laws and regulations on the use – either medical or recreational – of marijuana depend on individual states and are not under federal control. In general, the US has a more conservative approach regarding cannabis compared to Canada, but the use of recreational marijuana is legal in nine states – California, Colorado, Maine, Massachusetts, Nevada, Oregon, Vermont and Washington – as well as in the District of Columbia. In addition, medical marijuana is legal in thirty states as well as in the territories of Guam and Puerto Rico, and the District of Columbia. California was the first state to decriminalize the use of medical marijuana in 1996, and was followed by Hawaii in 2000 and by a number of other southern states in the following years. 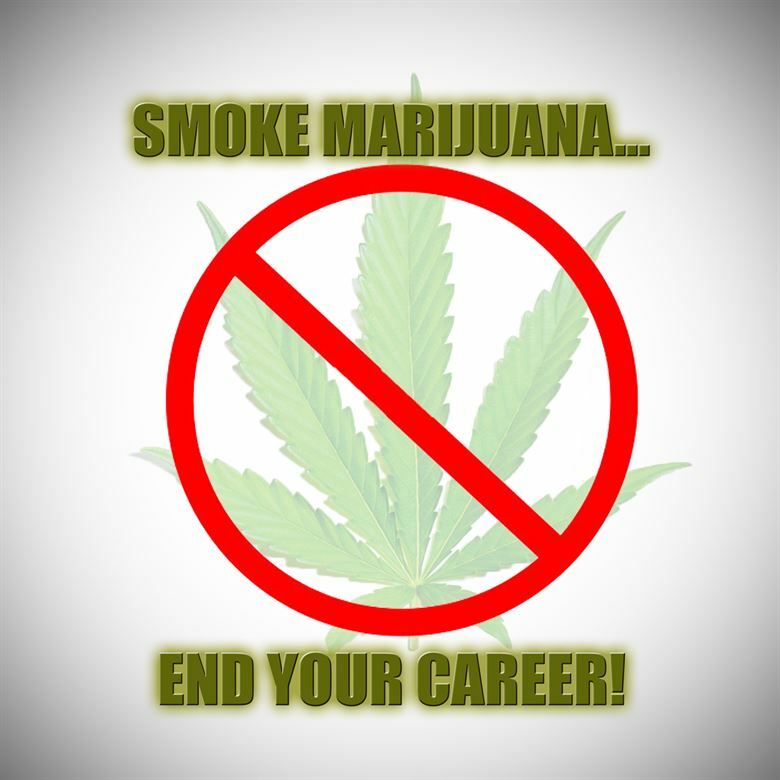 However, at the federal level, marijuana remains a prohibited substance under the Controlled Substances Act of 1970, and is classified as a Schedule I drug – meaning that it has high potential for abuse and not accepted for medical purposes – under the CSA of the Drug Enforcement Administration. The opposition of a number of federal agencies to the use of marijuana for medical purposes, has translated in slow research progress in the field, leaving the US to lag behind other countries, including Canada, in the decriminalization process. The use of medical marijuana is widely accepted and legalized in Canada, but also a growing number of American states has moved towards a more liberal approach to the matter, legalizing the medical use of cannabis. In both countries there are provisions that limit the use and possession of cannabis, especially for youth under 18. In Canada, patients with medical approval, can be shipped marijuana at their address, whereas in the United States, shipping cannabis is a felony. In the US, patients with medical approval for the use of marijuana – and exclusively in the states in which this is legally accepted – need to go to state-regulated dispensaries to purchase the recommended amount of cannabis for personal use. In addition to the differences highlighted in the previous section, other key aspects differentiate marijuana laws in Canada and the United States. Marijuana is used all over the world for both medical and recreational uses. In many countries, there is an open debate regarding the legalization of light drugs and substances, including marijuana. In Canada, the use of cannabis for medical purposes is already legal, and full legalization – even for recreational purposes – will come into effect in October 2018. Conversely, in the US, laws regarding the use of marijuana depend on individual states. Up to 30 states and additional territories accept the use of medical cannabis and 9 states and the District of Columbia also allow recreational use, while at a federal level it remains a prohibited substance. Giulia Squadrin. 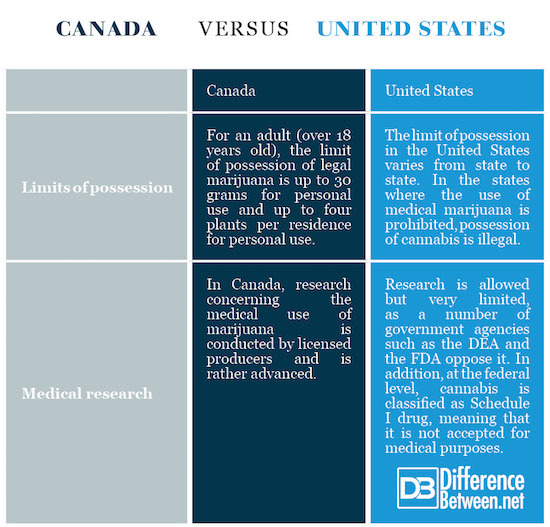 "Difference Between Marijuana Laws in Canada and US." DifferenceBetween.net. March 5, 2019 < http://www.differencebetween.net/science/health/difference-between-marijuana-laws-in-canada-and-us/ >. Abuhasira, Ran, Liat Shbiro, and Yuval Landschaft. "Medical use of cannabis and cannabinoids containing products–Regulations in Europe and North America." European journal of internal medicine (2018). ElSohly, Mahmoud A., et al. "Changes in cannabis potency over the last 2 decades (1995–2014): analysis of current data in the United States." Biological psychiatry 79.7 (2016): 613-619. Fischer, Benedikt, Sharan Kuganesan, and Robin Room. "Medical marijuana programs: implications for cannabis control policy–observations from Canada." International Journal of Drug Policy 26.1 (2015): 15-19.